Fine Japanese cloisonne box and tray by Ando of Nagoya. The Ando company, established in Nagoya in 1880, is the only cloisonne remaining workshop in Japan originating from the Meiji period (1868 - 1912) that is still active in the creation of cloisonne enamels. They retain the highly esteemed distinction of being appointed by the Imperial Household. 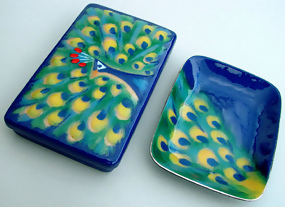 The two pieces presented are executed in musen or wireless enamel technique. The musen technique is finely executed, depicting a grand and beautiful peacock, worked in various shades of blue, green, yellow and red enamels. The thick enamels have created a wonderul raised or moriage effect. The counter-enameling on the reverse of these examples are finished in high-gloss black enamel. The tray is similarly finished, depicting the colorful plumes of the peacock. The subject matter of these examples is quite rare and unusual, with zoomorphic motifs being the most desirable due to their rarity.